Posted 3/11/2019 9:19am by Joshua Reinitz. We currently have pickup locations on the farm, St. Peter, and Mankato. We do have capacity for more pickups, so if you live in our neighboring towns like Belle Plaine, New Prague, Arlington, Le Sueur, Jordan, and have a group of people you think would want a CSA share, we are happy to find a location! If you are willing to host a drop site in your community or know of a business who can, we throw in a CSA share to compensate the host! Let us know if you're interested. We made a decision about 5 years ago to focus only on communities within 30 miles of the farm, to keep it as local as possible, rather than delivering everything up to the Twin Cities. We are firing up the greenhouse this week and planting our first seeds - the onion family, long-season herbs, and brussels sprouts. We are also working to tap around 300 sugar maple trees for syruping. These activities are sure signs that it will indeed, someday, be warm again and there will be green leaves soon. We welcome any feedback about your CSA experience. After 10 years we are moving past our "how do we grow vegetables" beginner phase, and into "How can we build community and connect people with nature through our work" phase. Ha! We do get a lot of feedback about too much food in the share, and we certainly don't want any of it going unused. We are consistently not great at things like carrots, beets, or baby greens. These are things we are always trying to improve. So if a different crop mix would suit you, lesser or more amounts, we want to hear from you! Farming in a variable and often extreme climate is very challenging (I can't sleep during downpours), but we are bringing 2 new large hoophouses into production this year that should help us mitigate some of these challenges and prevent crop losses. Particularly with the baby greens - it's almost impossible to grow them in the open field at this point so the hoophouses will help a lot. Another change we are making is opening our farm up to more tours, visits, and making it a space that people can hang out. I know we all have busy lives, but if you have a chance during CSA pickup time to come hang out, visit the crops, take a nature walk, we welcome it. We want to be more accessible to our amazing members, hear your cooking ideas, and talk about sustainability. We are going to announce a 2019 class and events calendar soon, and these will be open to the public. This is a new adventure for us - we've been so focused on growing crops (and kids) that we have not had as many events as we had initially hoped when we started this farm. Life circumstances change, the kids are getting older and easier, so we are making changes to our business too. Our 5-10 year plan includes making outdoor living spaces on the farm to hang out, have a bonfire, camp, and share food. We want to teach our skills, and help people connect with nature. So please keep in touch, even if you aren't doing the farm share. Follow us on Facebook and Instagram if you don't already, it's where we put out most of our farm news and photos. So, we are inspired! I'm sure we are all tired of this winter, it has been particularly tough. That sun sure is bright these days, and it is a sure sign of what's to come. Thanks everyone! CSA Sign-up, Winter News, 10-year farm-iversary! Posted 1/25/2019 10:16am by Joshua Reinitz. Our typical late fall and early winter goes as follows: we wrap up the CSA season, finish our wholesale obligations for the year, clean up the fields, and then we shift gears dramatically. After finishing up the farm season, we jump right into winter work - Sally has a couple of food service jobs and Josh is a barn restoration carpenter. Our farm communications usually lags during the winter (not intended, but it's not easy to think farm when we're starting at bare trees and snow). Then, around the end of January we realize it's time to order seeds, refresh our website, meet with wholesale growers, and sign up CSA members! This year is no exception and we have stayed very busy all fall and winter. Josh took on two barn restoration jobs for the winter months, Sally works at an organic cafe and serves at a restaurant, and of course our 3 boys are all busy in school. Home life is a string of animal chores, splitting wood and feeding the fire, and trying to keep ourselves from getting cabin fever in the dark evenings. Maybe one of these years we'll learn how to slow down and relax a bit? We were able to get away a bit this winter, despite being crazy busy. We have learned that we need to intentionally commit some money and time every year to leave the farm, go on vacation, recharge, and find our centers. Life on the farm can be isolating, and the work is non-stop. We have found that the only way to truly relax sometimes is to just leave. And we know how much of a family bonding experience travel can be. This past fall we took a trip to Texas to see some great friends get married. They live and work at a music festival in beautiful Texas hill country. We took the whole family on a road trip to the wedding, pitched a tent for the weekend, and had a great time. We were inspired by the festival grounds - beautiful spaces for music and art-making, a sense of community, and infrastructure to host many people for events. These are elements we have wanted to include in our farm and after our trip to Texas, we committed to making it a reality. our next 10 years will not only focus on great veggies but also on community building, farm events, and creative place-making. Another trip we took was our much-belated honeymoon. Sally and I have celebrated 15 years of marriage in 2018 and we have never taken a proper trip as a couple since then (it's always with kids, or traveling for work). So, we decided to leave the kids with Grandma for a week and go on a concert vacation to the beaches of Mexico! It was a blast, the host band (Dead and Company) played 3 amazing shows on the beach, and we were able to explore Mayan culture and architectural sites. It was another inspiring space that renewed our interest in each other and our lifestyle. A few days on the beach will do a stubborn Minnesotan good, I have now realized. We are now back from the tropical beach and 80 degree weather, enjoying (ha!) a 20 below windchill. Since it's too cold for me to work outside this week I have decided to get on the 2019 farm planning and open up our CSA member sign-up! please visit http://www.easthendersonfarm.com/members/types to sign-up or renew. Things are about the same this year as they have been the past few years. We feel like we have finally settled into a nice CSA size and routine, so we figured why change? We just celebrated our 10 year anniversary as an official farm business. Our first ten years were about growing our family, building our farm, and figuring out exactly how to run a successful veggie farm. Now that we have some confidence, infrastructure, and initial capital investment behind us, we are now looking forward to the next 10 years. As I mentioned above we are going to focus on beautifying our farm as a public gathering space, build community by hosting farm workers to live on our land, and work towards hosting public events. We also plan on hosting monthly workshops or events (think a farm-based community education program), so please stay tuned for our 2019 programming! Thanks to everyone who has supported our farm by buying a CSA membership, purchased our produce at the St. Peter Food Coop, eaten our food on a plate in a restaurant, or came out for a tour. We are continually working to create a local food presence here along our little stretch of the MN River Valley and we hope you can join us! Have a great winter, and we'll see you soon! Happy sloppy snow day from East Henderson Farm! Posted 3/5/2018 12:19pm by Joshua Reinitz. Howdy! We wanted to say thanks for joining our farm last year, and give you an update on how our current farming season is progressing (yes, we are already farming!). School is cancelled today, its simply nasty windy outside, but the CSA work has already begun. First of all, it is now the beginning of maple syrup season. We've tapped about 1/2 of our trees, and I plan on going out this afternoon during the snow to do some more. We purchased a new evaporator stove this year and are excited to put it to use. We are expecting a good syrup year, as we have good snow cover that insulated the ground from warming up too fast, and the snow supplies the trees with the moisture needed to make sap. Here's hoping for many gallons of good syrup! Next is the seed ordering and greenhouse work. We have put many hours into spreadsheets and seed catalogs in the past few weeks and have ordered our first seeds that will be started soon in the greenhouse. We generally get the greenhouse ready to plant by March 10, when we need to start onions and leeks, herbs, and a few early Brassicas (like Kale and Brussels Sprouts). I expect to start the first plants this weekend. it begins!! I am making a trip to Wisconsin on Wednesday to pick up our organic potting soil directly from the source (an organic dairy farm where they turn the manure into compost to start plants). I am going with my neighbor Dan, who is starting a CSA farm this year right across the road from us!! I am looking forward to building community with them, sharing resources and farming tips, and helping each other out. We each need 2 tons of potting soil, so we are carpooling and sharing fuel to make it happen. Some of you may know I recently took part in a delegation to Oaxaca, Mexico. I went with 13 Midwestern organic farmers and food business owners to learn about rural communities and agricultural systems of Oaxaca, and learn about how to change federal policy in the US to be more fair to Latin America. This trip was a partnership between two amazing non-profits, the Land Stewardship Project, and Witness for Peace. It was a completely transformative experience, both personally and professionally. It has motivated me even more to help change our farming systems and federal policy in America to be more sustainable and equitable to all people and all life in Nature. One major takeaway from our trip to Mexico was growing in polyculture, rather than monoculture. Our natural world does not operate by growing one thing in one place. Every natural system requires diversity to be resilient, and different plant complement each other and help feed each other. the fertility comes from decaying plants, nitrogen-fixing legumes, along with animal manures. Modern agriculture does not do this, it plants one field of one thing and bring in synthetic fertilizers produced with fossil fuels. This can't be the future of humanity because it is not sustainable long-term, and its primary goal is profit, not healthy food. Every farming village we went to in Mexico implemented a system called Milpa. This is the practice of growing corn, beans, and squash together in polyculture. The corn stalks provide the trellis for the beans to climb. The beans fix nitrogen into the soil to fertilize the corn. The squash plants vine out with their wide leaves and cover the ground to suppress weeds. All of these crops yield a complete diet - corn, beans, squash. And it is all organic. You might recognize this as what our indigenous Americans called the "three sisters". These crops and this practice had its origins in Mexico and Central America and migrated up to our lands through the trading routes of our indigenous people. Amazing. Seeing this practice in person, along with knowing it is how agriculture was done in the Midwest prior to European settlement, has inspired me to try it this year. I will be testing plots of corn, beans, and squash grown together in our fields. I have selected some popcorn and miling corn varieties, dry bean varieties, and winter squash for this. The corn and dry beans aren't things we've offered in our CSA, but I want to start. Well, that's what your CSA farmers have been up to! Please consider signing up soon if you intend to do so, even if you can't pay right away. We have introduced a sliding scale fee system this year, and anything you can pay within the range is good by us. And please call me at (612) 756-3971 if you have questions, want to talk farming, or just say hi! take care, and thanks again!!! Posted 1/24/2017 10:55am by Joshua Reinitz. I’ve seen this as a bumper-sticker mantra for many years and have generally agreed, but hadn’t put much thought behind it. After a 2016 defined by political drama, intense social discussion, and election obsession, I have really been thinking more about that phrase as a guiding principle. Think Globally Act Locally. Think Globally – humans now occupy nearly all of the habitable land on the planet. Our primary energy source for society is still fossil fuels that were locked away by natural processes hundreds of millions of years ago, a savings account of carbon if you will. Most public and private entities have a stated goal of continuous positive growth (forever?) that requires a steady input of that energy to sustain the system. Our resources are stretched thin, and are not evenly distributed among people. The system is not sustainable. With that as a backdrop, we cannot ignore global issues. In a time where America is going in the direction of self-focus (America First), it is long past the point where we have that luxury. We are all citizens on a planet with limited resources, as well as citizens of individual nations who want to compete for those resources. I feel torn between retreating to my own community and just shutting off the news and world concerns, or trying to educate myself about every global economic and political issue to be hyper-aware of what’s going on. It is quite overwhelming, and I know many of you feel the same way. On one hand, we have to focus on our individual lives and the concerns of our communities, yet on the other hand we have to carry the weight of global-level challenges. Act Locally – for most of us, this is the only real action we can take. Unless you are a high profile politician or CEO, you probably don’t have any real impact on world events. I have felt helpless and depressed when I’ve thought in those terms, but I also think that putting my efforts into local action and individual consumer choices is the only way I can make a difference. It can be quite uplifting and empowering. I firmly believe that the real power always is in the hands of the people. Grass-roots and individual efforts have the potential to turn into paradigm shifts. In fact, I think it’s the only way those major shifts in human thought happen – a small action cascades into major social movement. When I go to a store, I read labels. I look up ingredients. Where was it made? I am aware of the system that produces our consumer goods and food and know that every dollar I spend is a vote for a system I support. If I buy food in a box or can at the grocery store, I am supporting a system that is all about consolidation, commodity, global trade, subsidies, petroleum, and chemicals. I am aware of the global impacts when I spend my individual dollar. Think Globally Act Locally. So, what does this have to do with CSA? When you purchase a produce share from a CSA farm, your money goes directly into the hands of the producer. You receive high quality fresh food directly from the source. No cross country shipping, no warehousing, no profits to larger corporations and insurance companies. Direct farm to table. It doesn’t take long to figure out the global impact of that choice. The CSA farmers I know are incredible stewards of the land, have a farming system that sequesters carbon and enhances the ecosystem, don’t use many off-farm inputs, and are passionate about what they do. CSA farmers are also very likely to be engaged in community organizations, education, politics, family, and farmer activism. When you buy a CSA share, you are supporting a person who will use the profits from their farm to promote and practice sustainable living. I’d like to think I am one of them. It is a given to me that the food you get from a CSA share is of superior quality to what you buy in the store. There’s just something about having a farmer pay direct attention to a plant’s needs that makes it better. I’m sure we have all seen the studies showing little difference in organic food vs non-organic food nutritionally, but they do not address environmental and social impact of those different food systems. It’s not just about nutrition for one individual person; it’s nutrition for the global community of people. Spending a dollar on organic food supports a system that could eventually lead to a positive paradigm shift. A shift from a disposable consumer society to a sustainable eco-community-minded society. One where we are referred to by the media and government as people and citizens, not consumers. I don’t want to simply consume. I don’t want to depend on money to get things, I’d rather make them. If I don’t have the ability to make something, I partner with someone who does and perhaps barter for payment. This is the type of future I want, and is why I have chosen to farm how I do. CSA – Community Supported Agriculture. A community supporting a farm; and the farmer giving back to the community. It’s simple and beautiful, and it’s why I hope you choose to buy a CSA share from us this year! Posted 2/1/2016 9:40am by Joshua Reinitz. We are now officially open for CSA signup!! Our online signup page is live so please go there to signup or renew. We are offering a 7.5% discount to returning members until March 15 - our system uses your e-mail address to recognize you as a previous member, so let us know if it has changed and we can help you get renewed. 2015 was our best growing season by far, but we definitely had some challenges balancing family and farm life due to our weekly schedule. We have decided to streamline our CSA pickup choices in order to have more time for evening activities, family dinners, and other farm tasks like baling hay and animal chores. We realized that picking CSA shares 3 days a week was too inefficient, especially when we have wholesale orders to pick during the week as well. The biggest change we are making is that we be pre-packaging all shares into waxed cardboard boxes, and those who pickup on the farm will get their boxes from our walk-in cooler. We had been placing our produce in crates on tables for folks to pick from (farmers-market style), and although this was the customer experience we desired, it has unfortunately cost us a lot of quality time with our children. Also, we feel your produce will gain shelf life when kept cool in our cooler until pickup, rather than in the open air on warm days. Another change is that we have changed pickup days (for on-farm pickup). We are offering pickup on the farm and at St. Peter Food Coop on Wednesday afternoons. Additionally, you can come to the the farm during the daytime on Thursday. We are open to other pickup locations as well - basically we need about 10 members and a reliable location to deliver boxes, and we will set up a new pickup site besides St. Peter and the Farm. Please let us know if you are interested in hosting a pickup site, or can help us organize some members in your community so we can deliver to you. For all members, we will offer pick-you-own opportunities and extras when available. We planted a large strawberry patch in 2015 that should produce well this year, and we will always have extra beans, peas, greens, tomatoes, and herbs to pick when in season. The change in our pickup day and style will free up a lot more time for us to focus on weed management and our planting schedule. Our workweek has been a little out of balance - too much time picking and delivering, and too little time for crop maintenance. There is always room for improvement on a farm, and after 7 years of experience we feel like we are getting much closer to finding the balance. A consequence of our busy weekly schedule and growing family the past few years has been newsletters and recipes (and blogging about the farm). We understand the newsletter and cooking suggestions are a crucial part of the CSA experience, and we did a great job at it during our first 5 years, but our time for writing and planning has been very limited since we had our last child in 2012. So along with our updated CSA schedule comes some time built into our weekly schedule to write newsletters and recipes. I am looking forward to the new year and a chance to communicate on a more regular basis with our CSA members! Every year has brought us a new combination of unique needs based on the ages of our children (school schedules, evening activities, diapers, feeding schedules, etc.) For example, 2016 will be the first growing season EVER where we don't have a child in diapers! That alone will help us be much more effective in growing produce. As the younger one gets a little easier, the older two need more attention (especially in the evenings) and we need more family time away from the farm. This is another reason we have decided to pre-box our shares - members can come at their convenience to get their shares from our cooler, and we can focus on our children and work when needed. We understand we may be getting some new members this year, and we have expanded our CSA offering to accommodate 60 shares (we had 40 last year). Also, some new members may have been a member of other CSA farms in the past, and we would like to know how to best serve your weekly vegetable needs. Every farm is different and we may not have focused on the same veggies as your previous CSA, but it is early in our planning stages and we can make some changes based on feedback we get from renewing and new members. There is a brief survey on our sign-up page that asks about your top 5 veggies, least favorite veggies, and fresh herbs you like to use. We will also set some member meetings in late winter and spring to get feedback on how to make this a great CSA experience. Also, you can call us or e-mail us anytime to tell us what you liked and didn't like about the CSA. So please sign-up if you're ready, and call us at (612) 756-3971 or e-mail csainfo@easthendersonfarm.com if you have any questions. Posted 1/10/2016 6:07pm by Joshua Reinitz. Hi! It has been so long since I've written a blog entry here. This is a sorely overdue farm update / blog entry that I've been meaning to write for months. As new year's eve approaches and passes, I am like most of you; pondering life's direction and how to emerge from the winter with a fresh outlook. You get the point. As we are now pulling out of the terrible twos, the intensity is letting up a little bit in our family dynamic, I am ready for the new year. I made a resolution last fall to swear off Facebook for a while, ignore politics and world news, and simply live with my boys. Sally has been working the evening shift at the Henderson Roadhaus all fall and winter and for the first time I have been the primary caregiver and homemaker. It has been very refreshing and frustrating, and has taught me a lot about myself and my kids. Another resolution of mine was to start a blog and get back in the habit of regular communications regarding East Henderson Farm. So this is it!! I want this blog to be a vehicle for farm news updates, CSA newsletters, and my thoughts on our food system. You might see an entry about a project, my thoughts on GMO farming, new recipes we are trying, and so on. I did want to give a brief update on some farm projects, and plans for our 2016 veggie farming season. I have been working on two farm construction projects this fall and winter - restoration of an 1860's granary (and a lean-to addition), and our salvaged 6000-square foot greenhouse that will be operational by early March for our seed starting. This time of year when we have been lulled into a more relaxed state because of the winter, but there is growing anxiety about CSA member signup, seed ordering, and getting that greenhouse ready! So please bear with us as we get our membership signup details out. We are going to have to make some changes this year to better accommodate our family life. We have thought long and hard about what kind of CSA we want to be, and right now our family lifestyle has to rule our decision making process. To be brief, we are actually adding capacity for more members this year, but altering our distribution. We will fill you in more in a week or two, and offer sign-up with a discount for returning members. We hope you understand any changes we have to make, and continue to grow with us! I'll leave this first blog entry with a final thought. Food is everything. Agriculture is the foundation for every economy. Local food that bypasses the distribution chain and processors is the best food. You are what you eat, and healthcare begins with your diet. I could get angry about our food system, unfair politics and subsidies, fast food, junk food, but I'd rather do the only thing I know I can do to affect positive change. Grow good food for my community. We are community and I thank you! Posted 1/27/2015 11:54am by Joshua Reinitz. We are in the depths of winter here and are very much looking forward to getting out of doors and into our various garden and farm projects. With that being said, we would like to inform everyone of some new endeavors here on the farm and how we plan on going forward as a business and as a sustainable, fully working farm. Our first major change is a difficult one for us, but it is something we have been contemplating for a number of years. We will no longer be delivering to the Twin Cities Metro area this year. We know this is a disappointment to many of our members who have been with us from the beginning of our CSA endeavor. Since the beginning of our farming, we have added two more members to the family and now our focus must be on our children and home life. Many CSA’s have members or work shares pick up shares on the farm and offer a pickup location on behalf of the farmer, and we would like to see that happen but we just cannot do the driving ourselves with three small children. Please contact us if this is of interest to you and your neighbors or friends so we can continue to serve you in a new way. Another consequence of this is that we are reducing the number of CSA shares we sell, and we are changing our half share option. Instead of a farm that is focused solely on CSA production, we would like to grow more vegetables for the St. Peter Food Co-op and local restaurants, increase our grain and forage (alfalfa) production and increase our meat production (beef, pork and chickens). One benefit to reducing our CSA offering is that with fewer members we will have more time to focus on more difficult crops to grow like salad mix and carrots. Our share options will also be different this year. We will now offer a full share once a week and a half share will be a “full share” every other week. We feel that this will give all our members more vegetable varieties and larger quantities. Lastly, we are happy to announce that we will once again offer egg shares this year, as we will have more time to tend to our chickens. In closing we would like to thank all our members for supporting us through the years. You are the reason that our farm business has been a positive force in our life and has enabled us to continue farming all these years. We have also been able to develop and create new ventures on our farm. Even though we will not be delivering to the Twin Cities, it does not mean you are not able to support us. We will still welcome all to our farm during our open pick up hours to purchase eggs, individual vegetables and all of our other farm products (maple syrup, meat products, etc.) and to enjoy our nature trails and help celebrate during our farm parties and harvest celebrations. 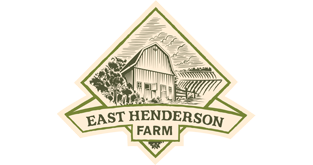 Our 2015 member sign-up is now open at http://www.easthendersonfarm.com/members/types We are offering a 7.5% discount for returning members until March 31! Members from any of our past years of operation are eligible. Please let us know if you need assistance in signing up. Again thank you for your continued support! Posted 1/26/2015 3:15pm by Sally Reinitz. I am writing to let everyone know that we have made some changes to our farm and our website. There has been some updating and new pictures posted. Please continue to check out our site as I will be continuing to add new pictures and letting you all know what is happening here on the farm. Our CSA membership sign up will happen this week, and you will be able to sign up here on the web....or just give us a call.....or visit.